Now you can build Microsoft technical expertise around your schedule. Brought to you by the people who write the software and available through your MS LP, Fast Lane. Additionally we offer the option to blend on demand training with instructor led training delivered by Microsoft Certified Trainers (MCT’s). 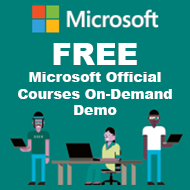 Microsoft On Demand courses provide you with 24/7 access to official video recordings of a Microsoft Official Curriculum (MOC) course. Recorded and delivered by Microsoft experts, the Video on Demand product provides access to all of the integrated features for 90 days from the date of activation. "MOD Advanced" version offers you an additional Exam Voucher and a Measure-Up Practice Test. "MOD Prime” combines the flexibility of MOC on Demand with the interactivity and structure of instructor led training giving you the best of both worlds. Whether you want to get ahead on your learning before attending the classroom or use MOD to reinforce what you’ve learnt ahead of taking the exam, this option is for you. POA - Prices will vary depending on the duration of the instructor led training courses. * Please note that a copy of the digital student guide is not included for our Microsoft on Demand Core, Advanced and Prime packages when paying with Software Assurance Training Vouchers. The digital courseware can be provided for an additional fee. Please contact us for further information.